Aeschynanthus was established as a genus by William Jack in 1823; Jack, a brilliant physician and botanist, died in Sumatra in 1822 at the age of 27, and almost all of his botanical work was published posthumously. Aeschynanthus is a large genus comprising approximately 150 species of vines native to southern Asia, from India in the west to the Solomon Islands in the east. All species are epiphytic, although some species may also be lithophytic or creep along the ground. Branches may be pendulous (e.g. A. gracilis), creeping (e.g. A. pulcher), arching and pendulous (e.g. A. fulgens), or erect (e.g. A. andersonii). Adventitious roots may form at the nodes. Leaves are typically opposite, but may be whorled as in A. augustifolius. Leaves in a pair are the same size and are often thick and leathery. This is due to large cells in the hypodermis that store water, helping to prevent desiccation, to which epiphytic plants are susceptible. Inflorescences are borne in clusters in axils along the vine, or near the end of the vine. The corolla has one plane of symmetry, is tubular, and always curved, typically longest on the upper surface. Flowers are five-lobed: two upper, two lateral, and one lower. Corolla color is generally red or orange, but yellow, pink, and green occur less commonly. Stripes of various contrasting colors often appear in the throat. The flowers are strongly protandrous (male portions mature first, wither, and then female portions mature) and bear two pairs of stamens. The large amount of low-sucrose content nectar that is produced indicates pollination by birds. Each calyx contains five sepals that are free to the base or may be nearly completely fused into a tube. The calyx matures well before the corolla and may fill with water in those species having a fused calyx, perhaps serving as a form of protection from insects. Seeds develop in a long, narrow capsule. All seeds have at least two appendages. One is near where the seed attaches to the capsule (the hilar end) and one at the opposite (apical) end. In some species, like Aeschynanthus radicans, a cluster of inflated cells called bubble cells occur at the hilar end of the seed. The apical appendage may be long or short and stout. Hilar appendage(s) is/are either one in number, which are then short and stout (e.g. A. rhododendron), intermediate (e.g. A. acuminatus) or long and thread-like. These appendages aid in wind dispersal and may also help attach seeds to wet bark upon landing. Aeschynanthus has been divided into six sections based largely upon seed characters, although section Xanthanthos (Wang) is defined based on corolla characters and contains only two species. Both a SEM study of the seeds and an nrDNA study have concluded that Aeschynanthus consists of two clades, each containing three sections. The majority of species from section Haplotrichium belong to one clade, but a few species belong to the other. However, the genetic study looked at only one gene and more robust research is needed before any reorganization of the genus is completed. At this time it is best to simply keep in mind that there are problems with the sectional arrangement, and that more work remains to be done. 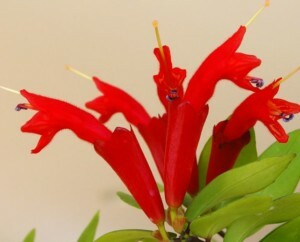 Aeschynanthus are easy to grow in the home as they do well in typical household temperatures and humidity levels. They do well in a bright window without long periods of direct sun, which may burn them. Drying out for a few days between waterings is not harmful. The wide array of species allows growers to choose plants that can be quite showy when they blossom, and many have foliage that has an architectural appeal as well. Some, like A. longicaulis have wonderfully mottled leaves, making them interesting even when not in bloom. Many plants are small growing, like A. ‘Coral Flame’ (approximately 0.5 meter vines) and A. gracilis. Larger growing plants include A. ‘Thai Pink’, which rapidly grows to 2 meters, and A. radicans. Both of these plants have large flowers that contrast nicely with their fused calyx.